Dele writes: If you’re planning on camping and exploring the great British outdoors this summer, then here are a few ways to avoid undue pain and cramps. Summer in Britain is one of the most wonderful times of the year, as it gives us the opportunity to explore the UK’s bountiful landscapes that otherwise remain untouched during the cold months. This summer, many of us will be keen to pull the tent out from the cupboard, brush off the dust and cobwebs and pitch it in a field or at one of the numerous festivals taking place this time of year for a spot of camping. 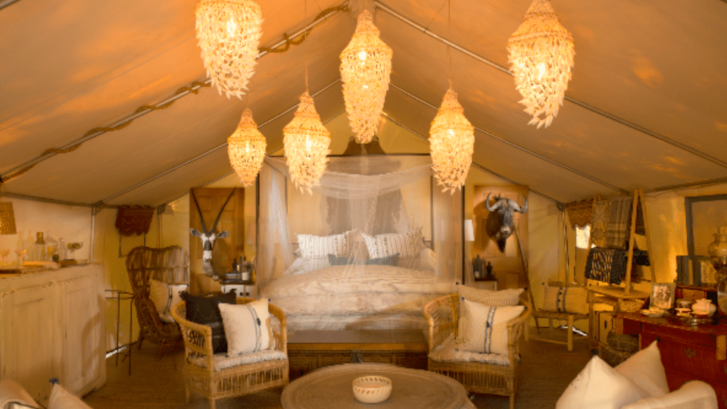 Clearly, glamping may be the answer…. However, sleeping on a hard surface may cause problems for your back, so here are a few tips for you to follow to ensure your campsite is a comfortable one. It’s very important to protect your back against hard and sometimes damp surfaces while camping to avoid backache, so always sleep on a good quality camping mat or air mattress. If you can, try these out in a shop before buying them. Make sure you remove any large stones or sticks that could dig into your spine while you sleep. Ensure that you are sleeping in a position where your spine is in a straight line as this helps to avoid neck and back pain. Remember to take a pillow along with you too, as this will ensure that your back and neck stay aligned. Make sure that you lift and carry your camping equipment with care. Top tip: make sure you carry your equipment in two bags rather than one to distribute the weight evenly and reduce strain on your back when carrying them. We know, this may sound strange but you will probably have used your back in some pretty unusual ways over the previous day and it will know about it. Gently stretch things and see how much better it will make you feel in the morning.